Alright, so that’s a bit too blunt. I do read a lot online; magazine articles, blog posts, emails, and other “short form” digital media clippings. When I say I don’t read, I’m using the common idea of what “I’m a reader” typically means to people. For example, my wife is “a reader.” She has no fewer than 3 to 4 books on her nightstand, will be reading multiple books at once (including ebooks on her Nook), and does not hesitate to “put down a book”, never to finish it again due to lack of interest or time. That sort of thing drives me crazy! I’ve always been the type of person that feels compelled to finish something that I’ve started (although the last 5 episodes of Caprica still lingering in my Hulu cue may say otherwise). 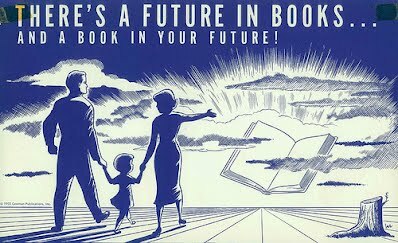 “THERE’S A FUTURE IN BOOKS and a book in your future.” Vintage book poster by Cowman Publications. circa 1955-1960. Back in the late 90s, when I could still consider myself to be a reader, my bed-side table always had at least a couple of books, one for a college reading assignment, and one for my own personal pleasure. Sometimes a text book or two might get tossed in there, but for the most part my life was filled with lots of great trade paperbacks, young adult literature (I was an Elementary Education undergrad), and the occasional piece of science fiction. After graduating from college in 2002, finding a job, getting married, having kids, etc. I slowly found myself finding less time to read for pleasure, forced time to read for my master’s work (most of that reading being online), and eventually the most I read these days are Roald Dahl and Peter Pan to my kids at bedtime. I can’t complain about reading such excellent children’s literature most nights with my kids, but thus far this year I’ve only managed to read one book for myself from cover to cover. That’s it, just one single book, and even that took me almost 9 months given my sporadic reading cycles. It’s not that I try to avoid reading, I’m just not that great at it. Sure, I can skim through digital texts and webpages with the best of them, but I am a slow, deliberate, and plodding reader. I’m not sure if it’s a decoding thing, a slow comprehension process, or some form of mental “slow down, and savor this” obstacle that my brain puts up whenever I sit down to read, but it typically takes me 3 to 4 times as long to read the same passage that my wife or another equally accomplished reader might be able to do. Thus, when I attempt to read books together with my wife I get frustrated, and give up before long. Which is why I’ve always wanted some sort of open and accountable process for forcing me to read again, while being able to deliberately slow down the process (because training wheels aren’t always that bad of a thing). This is how I feel sometimes about reading, even if it’s only just one or two books. So I decided, what the heck, I’ll construct myself a loose digital framework that deliberately slows down the discussion and enjoyment of a text through a collaborative online meeting space. I know that I’ve always done my best reading in an educational setting, when our small high school literature groups tore into books like Grapes of Wrath and A Tale of Two Cities. While working at a children’s bookstore in the summer for several years of college and beyond, I eagerly read young adult and children’s literature so I could talk with customers about what they liked, and what I found exciting, thrilling, or frustrating about the books in the store. The common thread in both instances was community; a face to face connection that is difficult to capture online through asynchronous means, forum posts, and status updates. I also had a huge layer of accountability to make sure I had actually read the book! The literature group needed my input to be successful, and customers wanted to hear what I thought about some of the books in the store. And that’s where an idea for an online video chat came into my head. It would be easy to replicate everything that I’ve been considering with a face to face virtual meeting through Skype, a Google+ Hangout, or some other video chat. It wouldn’t be good enough just to put up a sign saying “hey, let’s do a video chat about books”. There would need to be some sort of framework and expectation of what to read, when to read it, and how to best organize the discussion. There are certainly many tools available online to create digital spaces for discussion including a free forum, a Google Group, or WordPress blogs, but I wanted this effort to serve a dual purpose, killing two birds with one stone, so to speak. Not only do I want to be “a reader” again, but I also want to help put together a loose model for what an effective online book club might look like using Google Apps for Education tools. Why? I support some 260 teachers and almost 4,000 students that all have access to Google Apps, and while many use Google Docs, Gmail, Calendar, and Groups effectively, I also wanted to start creating some integrated and innovative way to leverage the connectedness of these tools, and I think I might have a decent start. Starting this Thursday, October 11th, at 8:30 pm EST, I’m going to be hosting a Google+ Hangout each week for 4 to 6 weeks, discussing a book that I’m tossing out to the internet to decide. I’ve put together a Google Site (a rather frustrating and limiting experience given what I know I can do using WordPress or building a website on my own), tossed up a simple Google Form, and have a YouTube video describing my thoughts behind the book club in a bit more animated detail than what I have here. I fully expect a big fat check from Google any day now for all of that advertisement, and if it’s not enough, I also have plans to use Google Moderator and perhaps Google Groups to help facilitate both communication and discussion. Voting is going on right now, and while I don’t have much else than just a simple overview on the site, I thought it might be best to start documenting the process here, so I have a lot of my thoughts out of the way when I start to unravel the entire experience at its end this November, and I can build something that’s useable for teachers and students in my district for the second semester. All that’s left is to try and get enough people to actually participate with me, and help me read a book. Care to join the discussion?